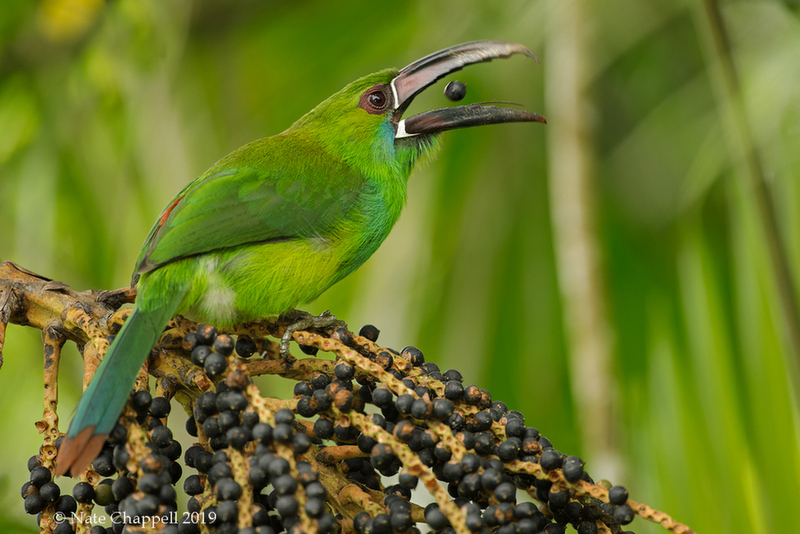 Here's another one from our recent trip, nice to find a Crimson-rumped Toucanet feeding on a palm right next to the lodge. Canon 5D4 500F4 1/320 F5.6, fill flash, iso 800, full frame. Perfect timing to catch this behaviour of tossing the fruit, Nate! and to think when we were children we were always told not to play with our food. Lovely detail and a nice flash of the crimson rump. Great shot , tossing the fruit- beautiful colors in this bird-well shown off here. Excellent! Excellent timing on this and a great shot! Amazing bird & toss . Beautiful image. Nate perfect timing – striking shot. Well done! Perfect timing, great bird too... Well done Nate !